Worst to first. That phrase was used ad nauseum to describe the fortunes of the Minnesota Twins, the bums turned heroes of the World Series. 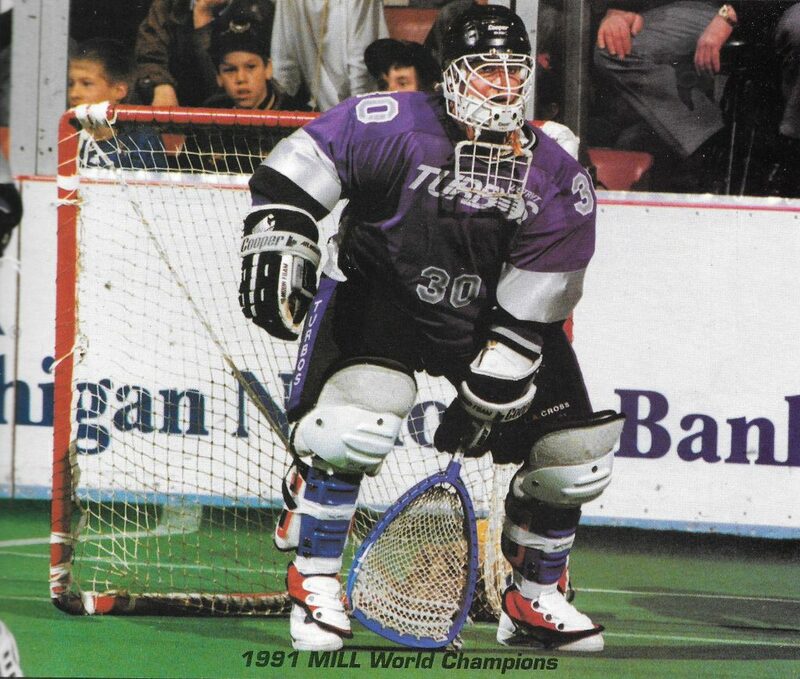 Fortunately, the Detroit Turbos, who did the same thing last season (on a smaller scale, of course) in the Major Indoor Lacrosse League, have been spared that sort of glib phrase-making. Until now. Let’s see…” Awful to awesome.” “Torpid to terrif- ice” “Ghosts to mosts.” Okay, okay. They’re all pretty bad, but work with me on that last one. In 1990, the Torpids, er—Turbos, finished last with a 1-7 record. Sure, they lost a lot of one-and two-goal decisions early in the season, but by the final game—an 18-9 loss to Baltimore—they were walking shadows, ghosts of the league runner-up team they were the year before. Last season, though, they were a team of mosts: most goals (184), most assists (227), and most penalties (81 for 228 minutes), which means they probably also had the most man-down points—no record is kept—since they played the equivalent of almost four games without six players on the turf. And all that was before they beat Baltimore, 14-12, for their first league championship. 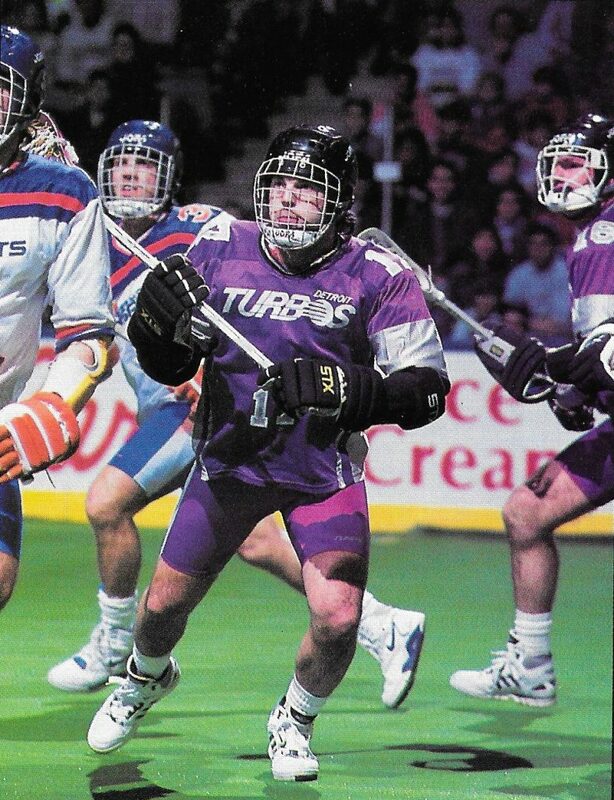 If there was any doubt before last season that the Turbos, who had acquired the Gait Brothers and, apparently, a new attitude in the offseason, would challenge for the title, there is none this year. 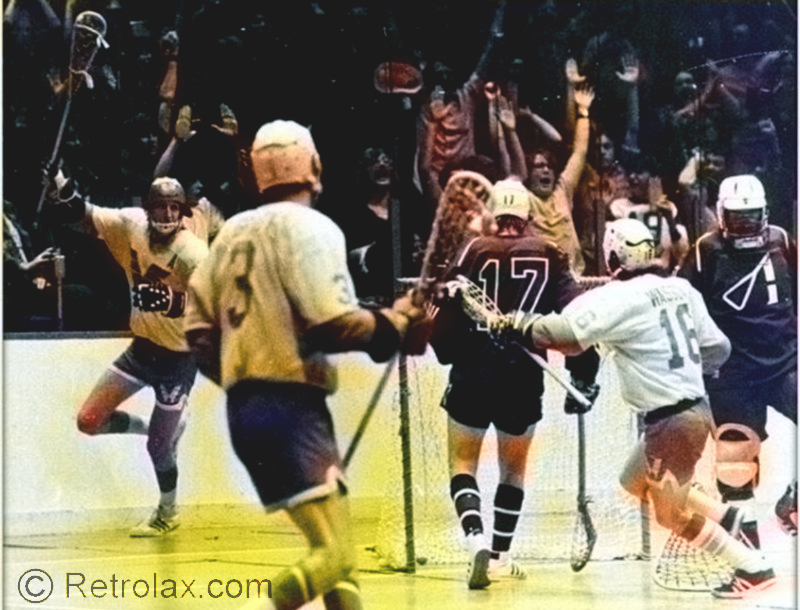 The Gaits—who broke the MILL’s scoring records for goals (Paul, 47), assists and points (Gary, 36/68)—are back for their second seasons, their power, quickness and stickwork intact. The rest of the league isn’t pulling up a chair to watch them, though. Every general manager—genial Dr. Frankensteins all has retooled his monster for this season, adding finesse and speed to accommodate the shorter shot clock (it’s been trimmed from to :30) and power to bump and grind with the Detroit dreadnought. 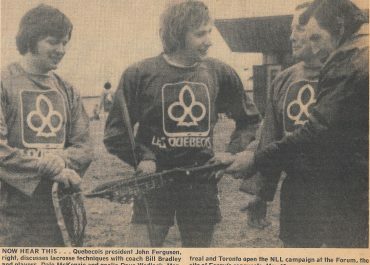 They’ve also been luring Canadian box lacrosse goalies over the border because, as one G.M. put it, “Those guys know how to play the game. Will it be enough to unseat the Turbos? DETROIT’S (9-2) BIGGEST PROBLEM may be Detroit. 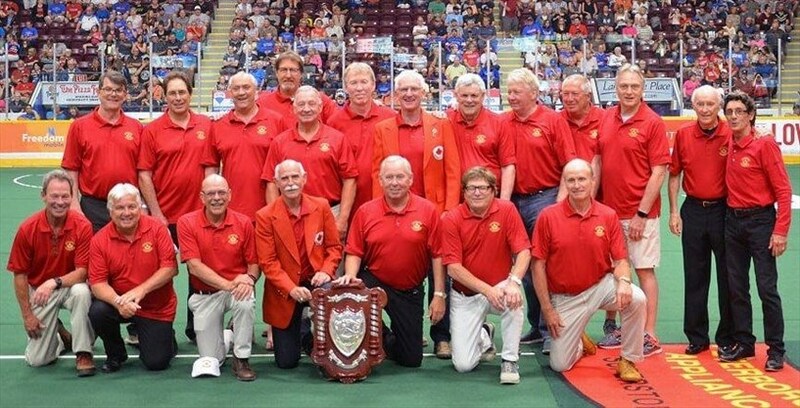 The team returns all it’s big guns: Pete Parke (third in the league in goals scored behind the Gaits), Brian Lemon (five goals in the final), Terry Martinello, Jacques Monte, Armando Rodriguez and perennial All-Pro (or somewhere near it) goalie Ted Sawicki. 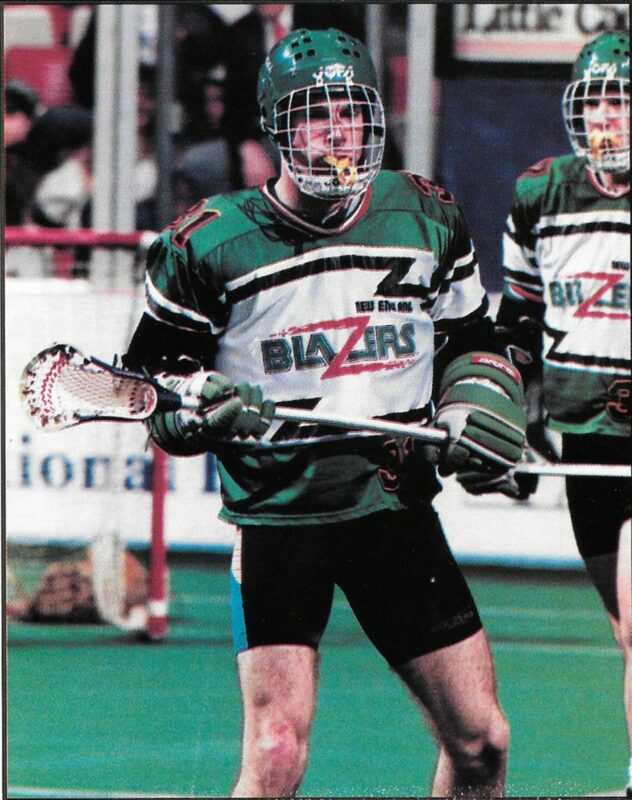 Add to that “go-to” man Brian Nikula (acquired from Pittsburgh when he decided to return to school in Canada) and a handful of young Canadian box lacrosse players picked up in the draft. 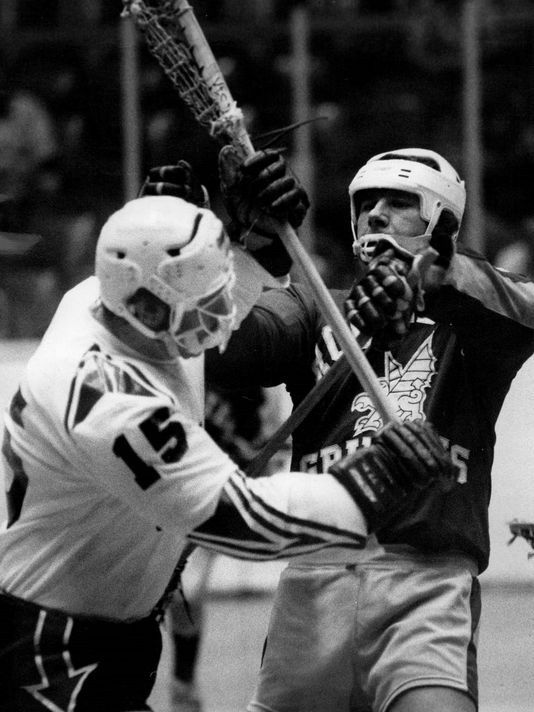 Pretty formidable, but complacency is a big concern,” said 1991 GM of the Year Tom Wright. 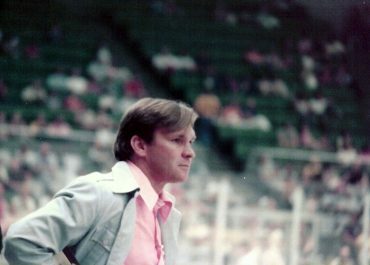 He recalled that in one of the team’s two losses (their only two) to New York, they frittered away an eight-goal lead. Penalties were also a factor— “it’s hard on the team,” Wright said. 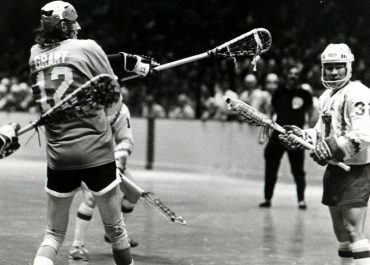 It’ll be harder this year, because man-down teams will be held to the shot clock, so it won’t be as easy for players with good stickwork to kill penalties. 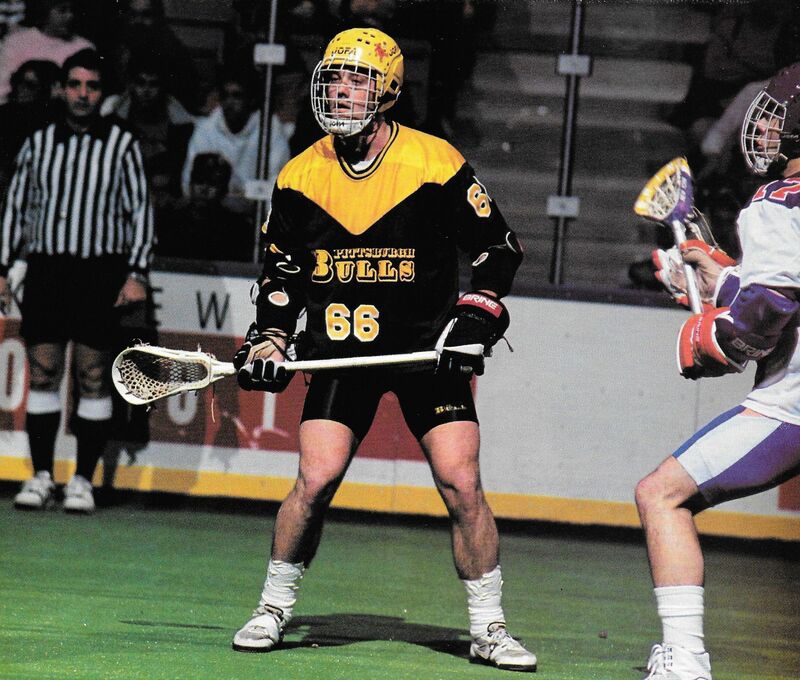 PITTSBURGH (3-7) WAS STUNG by the loss of Nikula, but they’re getting back Dave Pietramala, “the only guy in the league who can take the Gaits out of the game,” according to Skip Lichtfuss, the Bulls’ new G.M. Petro was injured and out for the season after the third game last year land that really hurt the team” said Lichtfuss, a former Bulls’ player and coach of the Mt. Washington Wolfpack, champions of the U.S. Club Lacrosse Association “If he’s on your team, he makes it better.” The Bulls have a strong mix of veterans – Matt McGeady from Philly, Tom Vorstell and Phil Willard “out of mothballs,” Lichtfuss joked—to complement proven talent like All-Pro Ed Stephenson and Brian Reith and work with youngsters like second- year men Tim Hormes and Bob Martino IWashington Coll.) and draftee Chris Colbeck (Loyola). BOSTON (3-7) HAD A SIMILAR TALE at the beginning of last season. They lost John to retirement. “Besides being skilled and he really showed all the young guys how to play,” said Blazers’ G.M. Peter Lasagna. “Nobody stepped into his place.’ This year, Lasagna is looking for veterans Tobv Boucher, Tom Carmean and Walt Cataldo to do that. 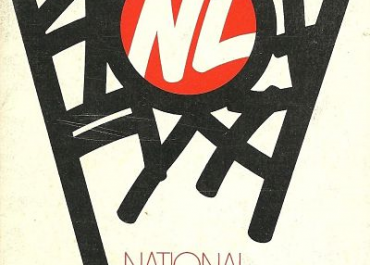 He is also expecting big things from Tim Soudan and a pair of unheralded rookies, Ohio Wesleyan All-American Neil Ringers and Union College’s John Keller, “the best player no one has ever heard of.” The Blazers acquired a key seventh in the off-season, the Boston Garden. Moving to the legendary home of Cousy and Orr “has been tremendous motivational factor,” Lasagna said. 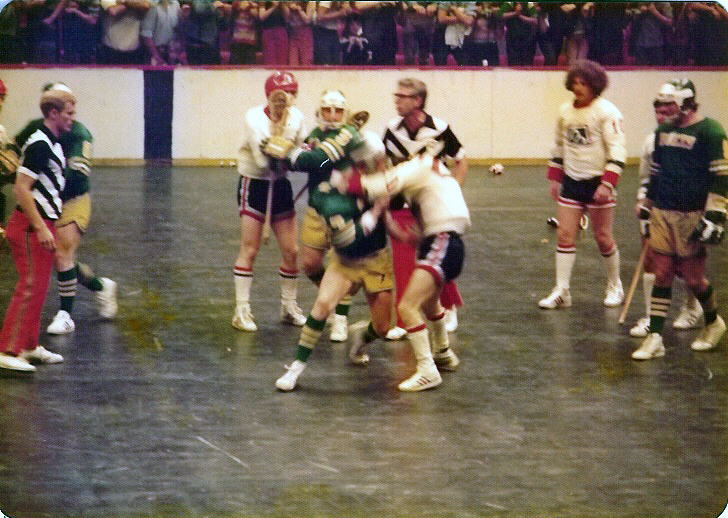 The team had loyal support forty miles to the west in Worcester, MA, but they still had the lowest attendance in the league there. BALTIMORE (6-5) IS LOOKING avenge last years championship game defeat. The Thunder nearly struck down Detroit in the title game with a late rally. “Five more minutes and we might have beaten them,” said G.M. Darrell Russell. He seems to have assembled a strong sixty minute team by adding draftees such as Tony Millon (“a wonderful talent,” Russell said. 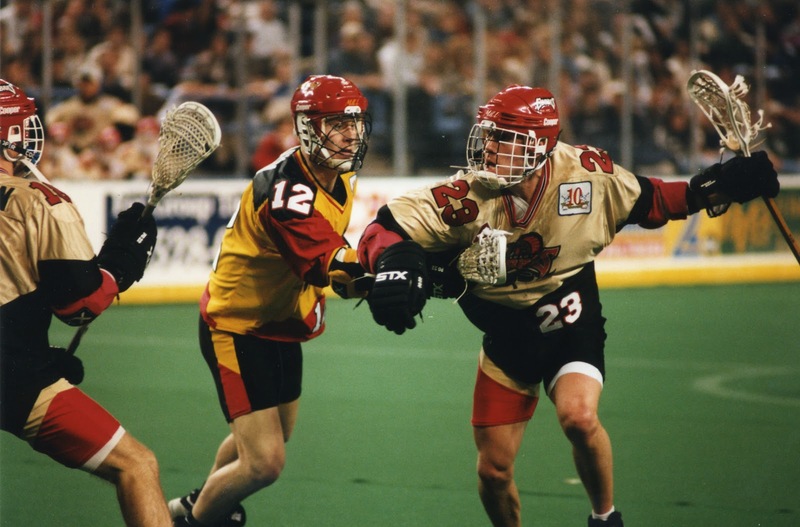 “[Towson State} coach Carl Runk described him as the toughest player he’d ever had.”) to a core of veterans led by Rick Sowell (third in the league in points), Jeff Jackson, Pat and Tim Welsh, and goalie Jeff Gombar. Russell is also excited about his second year players, particularly Brian Kroneberger. “He loves the game and he loves to hit,” Russell said. AS DOES NEW YORK (5-5), which used physical play when it counted—during faceoffs and loose ball situations—to beat Detroit twice last season and win three of their last four after losing three of their first four. This year, Saints G.M. 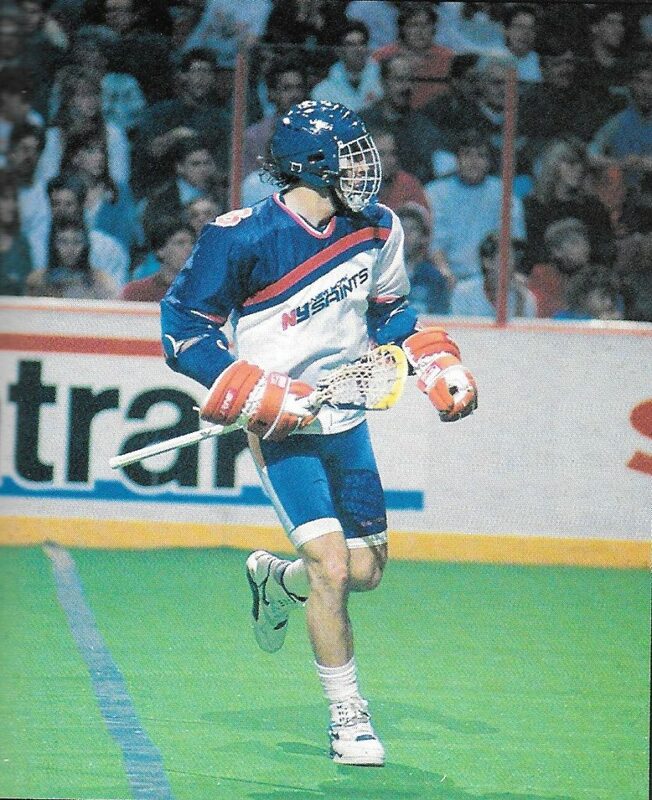 Tom Flatley added to their faceoff strength by drafting Andy Kraus (U VA). 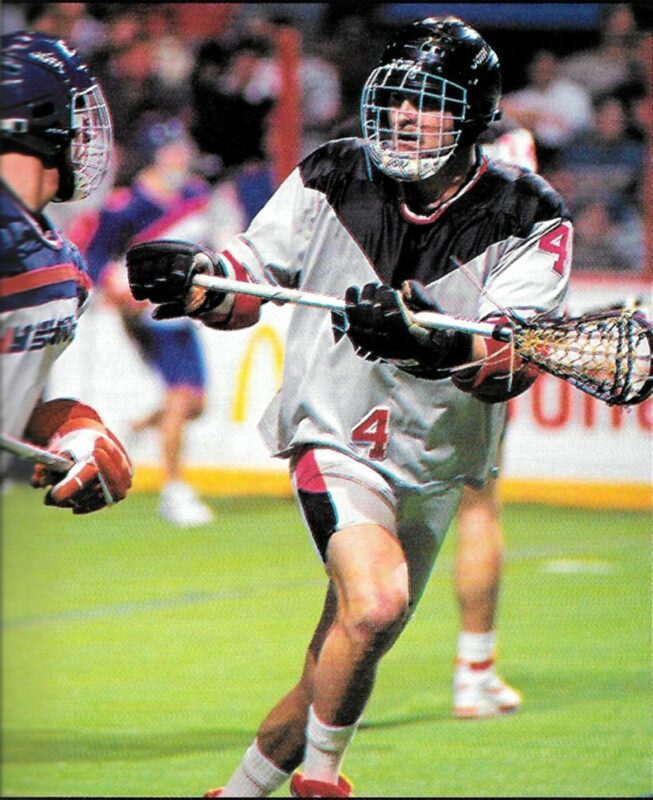 Five-year men Matt Crowley, Don Borges and Jeff Nicklas lead the returnees, which include Aussie Gordon Purdie and his former teammate at Adelphi, Bob Cook, as well as World Team goalie Sal LoCascio. Second-year man Jon Reese is also back and feeling fit. BUFFALO, “NEKILs” (new kids in the league) this season, should make themselves known quickly. Like Detroit, roughly half their team is Canadian, and like Detroit, they’ve imported some of the best. Like John Tavares, who was acquired in a trade for Brian Nikula, “I hate to lose Brian,’ said G.M. 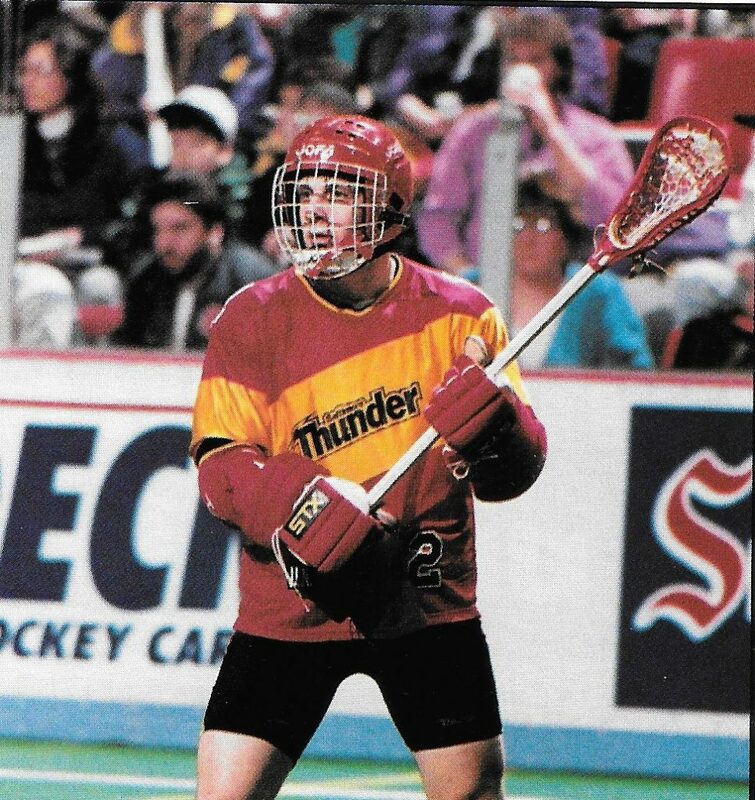 Johnny Mouradian, “but John [a scoring leader in Canada’s box lacrosse league] is more of an all-around player. 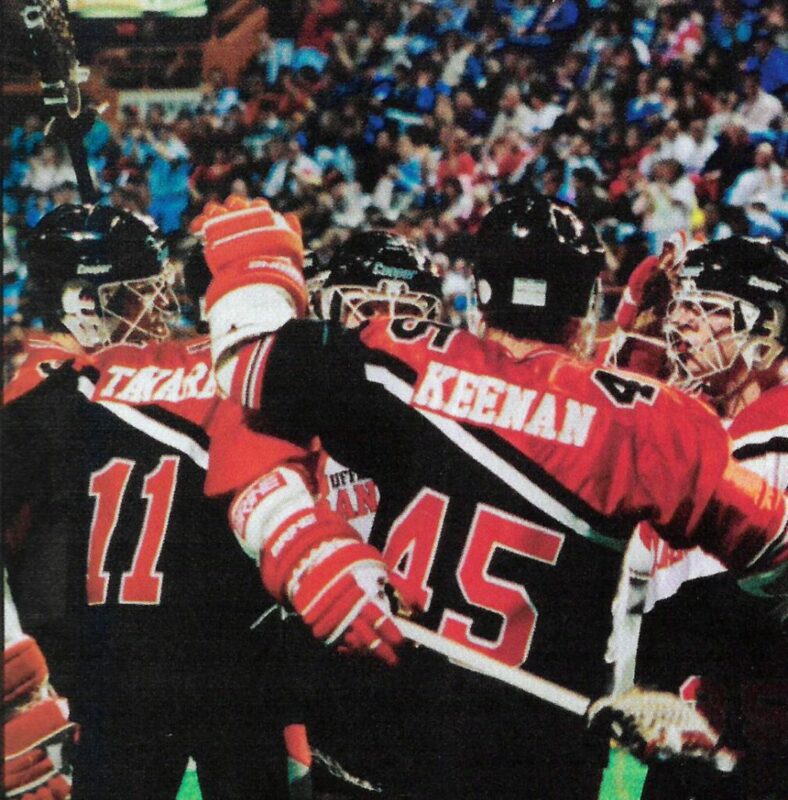 “From the U.S., Rick and Darris Kilgour should run together on a line, and Tim Nelson and John Zulberti, standouts from Syracuse, may help the Bandits commit larceny—of the title, that is.